You are about to see the wussiest dogs imaginable! They are so scared of a little smack from a kitty that they won’t even walk past the resident feline! It’s just more proof that we cats rule and dogs, well… you know the drill. If you can’t see the video above, click here to watch it on YouTube! hahaha!!! That is SO hilarious! Oh Sparkle! That video was the bestest!!! Mes happy mes gots to gets out and visits yous! Me has missed everybody. That’s soooo funny! All that is takes is one swat from the cat and the dog knows who’s boss. I have to yell at my kitties to be nice to the dog when Sammy the Weiner Dog stays with us. They bully that poor dog! Looks like some pretty smart woofies to us! HAH! Catâ€™s rule!! We are the most powerful of the species. 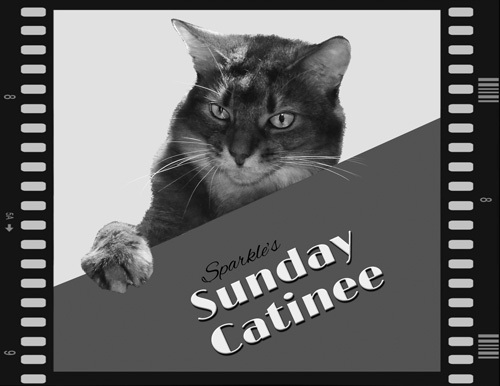 I’m going to go out on a limb here, Sparkle, and say this is the BEST Sunday Catinee EVER. Every kitty in America should swell with pride!!! LOL!! What a cute video! These big dogs hesitate to pass at the sight of kitties…too funny! I’ve heard that! I’ve heard that doggies drool. Of course, my sister Constance has been known to get a little drooly, too. MOUSES! PS. Please come on over to my blog for a visit later. There’s a special little somethin’ waitin’ for you there. Those dogs have a lot more respect for the natural order of things than the peeps who keep trying to call the dogs past the cats when it’s obviously a bad idea. Peeps are so clueless about the natural order of things sometimes. molol! we all got a great laugh out of that video, Sparkle! ok, maybe not Wriggley 😀 He’s afraid to walk past us even though he could easily eat us! Cats rule! Just more proof cats rule! And always will! Those are pretty darn brave cats. The dogs next door chase the cats right up trees. The cats are smart enough to know when they can get those dogs on the stairs. Have a great day. MOL! How funny! Clearly, those woofies have learned to respect the feline.